Sign up for Broadjam today to follow Larry Bagby, and be notified when they upload new stuff or update their news! 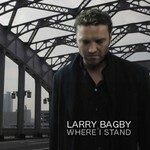 Inspired by the legendary sounds of Elvis Presley and The Beatles along with the more modern melodies of John Mayer and Dave Matthews, Larry Bagby brings us his latest CD Where I Stand. Based on the last two years of his life, Where I Stand is a musical journey that successfully blends the up beat resonance of rock and roll with the richness of alternative country.